China is expanding and enhancing its military presence in the South China Sea, seeding the Spratly Islands with air bases for fighter jets, radars and missile posts with retractable roofs able to fire long-range surface-to-air missiles. "New missile shelters, radar/communications facilities, and other infrastructure are going in on Fiery Cross, Mischief, and Subi Reefs" in the island chain, AMTI posted on Thursday. Military assets and dual-use facilities are being erected at an increasing clip, according to imagery from the Washington-based Asia Maritime Transparency Initiative. China says it is committed to peace with neighbors who dispute its claims to various reefs, islands and islets in the South China Sea, but the construction shows China is keen to project power throughout the body of water and beyond. In May, the Association of Southeast Asian Nations (ASEAN) decided on an outline for a Code of Conduct in the South China Sea. The Philippines has disputed multiple islet claims and access to fisheries with Beijing but under President Rodrigo Duterte the country has done a 180-degree shift to pursue China and Russia—not Washington—as top allies, despite an international court ruling in June 2016 that found the Spratly Islands to be legitimate possessions of Manila. "I am now working on an alliance with China and I hope to start a good working relationship with Russia," Duterte told RT in May. The Philippines has pursued cozier relations with China despite their disagreements in the South China Sea, and when Washington nixed a deal to send arms to Manila to fight terrorism, Duterte all but pulled the plug on his relationship with Washington. 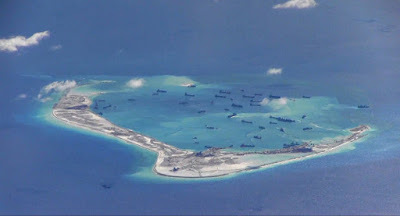 Fiery Cross Reef appears to be the most developed of the "big three" installations, AMTI noted. Earlier satellite imagery suggested there were eight missile shelters on the island, consistent with the number of batteries on the Mischief and Subi reefs. Images captured in June show four more new installments on Fiery Cross, Reuters reported.